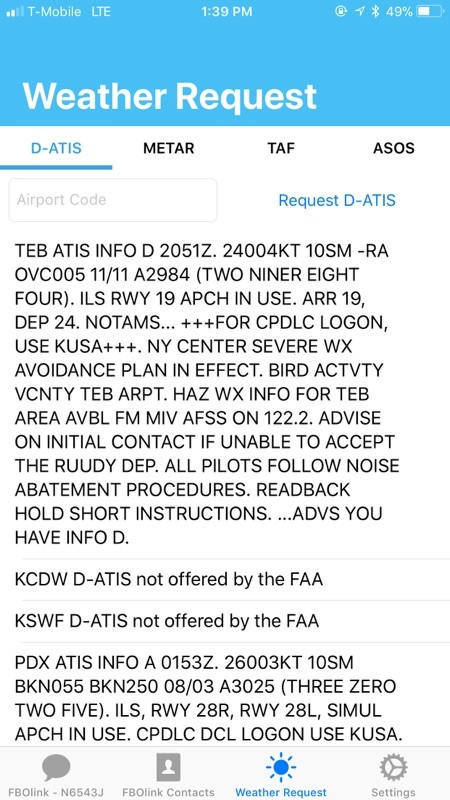 The free FBO Link app from Send Solutions provides a simple method to access D-ATIS in aircraft not equipped with the right kind of FMS. Aircraft equipped with Airtext don’t need the FBO Link app, as the messaging system is a subset of the Airtext functions and can be accessed directly without the app. To use FBO Link, the FBO connects a small USB device into the computer at the customer service desk. The device has a light that turns blue when a new text message is received from an FBO Link user. If the CSR doesn’t respond to the message right away, the light will flash blue and yellow. The CSR can respond to the pilot via text message and accept the pilot’s request, or ask any questions to clarify the request. When the link is active, the light remains green until a new request arrives. FBO Link is free for Apple iOS and Google Android devices. FBOs that sign up with the FBO Link network pay $300 a year to participate. FBO Link launched with Wilson Air Center’s four FBOs as the beta testing sites, and Gray expects to add more FBOs now that FBO Link has launched, beginning with FBOs patronized by Airtext customers.